Remember when practice matches were called practice matches, rather than ‘regional challenges’ or ‘Sponsor’s Cup’? Remember when life was in black and white? This photo, from Le Dawn Studios, shows a practice game in March 1970 between North Melbourne and, apparently, a combined country team. Note that the score for the visitors is being changed, from 19.13 (127) to 20.13 (133). Hopefully the scoreboard attendant wasn’t distracted by the kid climbing up the ladder. Also note that at least one of the players (far right) hasn’t eyes for the ball. Maybe he’d just been dragged. Played at the Wangaratta Rovers ground, City Oval. Combined team is the Rovers and the Wangaratta Magpies. 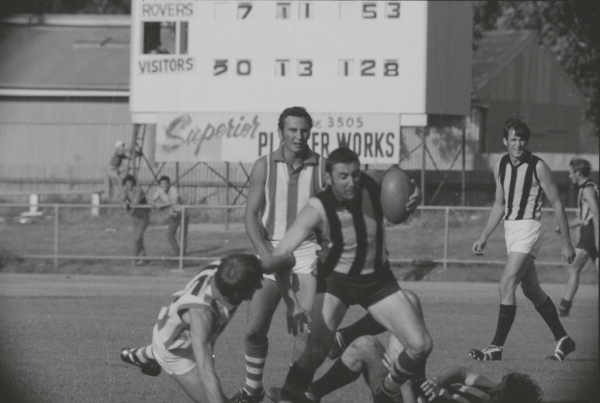 Williamstown played Wangaratta Rovers in practice matches in the 1970’s. I remember seeing the game at Willi against the Rovers.